Macular degeneration means atrophy of the macula lutea, otherwise called yellow spot. The macula enables to see fine details very clearly, and for an example, to read or to drive a car. If the yellow spot stops working properly, then the central vision could be weakened by obscurity, dark areas or distortions. The degeneration of the yellow spot affects the ability to see closer and far, and could make some activities completely impossible, like to thread a needle or reading. Although AMD reduces vision in the central part of the retina, it does not affect the eye's peripheral vision. E.g. you could see the contours of a watch, but you can't see what time it is. 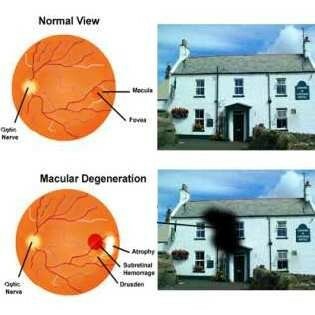 Macular degeneration alone does not cause total loss of sight. Even in advanced cases vision is preserved to some extent and very often the persons with this condition can take care of themselves. 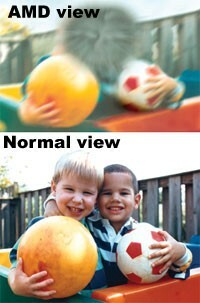 In many cases the affect of macular degeneration on vision quality is minimal. Macular degeneration on older adults is part of the natural ageing process. There are many problems related with the yellow spot, but AMD is the most common. Its causes are not entirely known and there's no treatment available to cure everyone. Macular degeneration is the main severe cause for loss of sight amongst Caucasians who are older than 65. Two of the most common types of macular degeneration are atrophic (dry) and exudative (wet). The atrophic AMD is more common than exudative and it is caused by ageing and the loss of macular cells. The loss of vision is usually gradual. The exudative AMD makes up 10% of most AMD cases and it is a result of abnormally formed blood vessels under the retina. These new blood vessels leak blood or liquid, which weakens central vision. Loss of sight can be rapid and severe. 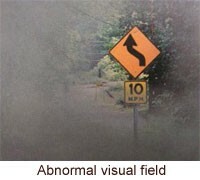 Printed text appears blurry * A dark or an empty area appears in the middle of the visual field. * Straight lines are distorted. Although the reasons for AMD are not completely known, food supplements, like vitamins with anti-oxidant qualities and zinc, can prevent the progression of macular degeneration. An extensive scientific research proved that taking high doses of vitamin C and E, beta-carotene and zinc reduced the risk of developing advanced forms of AMD by 25%. However, test subjects, who didn't have AMD or who had it in its early stage, had no clear benefit from food supplements. 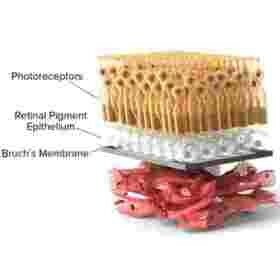 The most common sign of macular degeneration is the formation of small deposits called drusen under the retina. The drusen alone do not cause visual loss, but if their number and size grows, it usually leads to an increased risk of developing AMD. People with the predisposition for advanced AMD have noticeable drusen, prominent dry AMD or abnormal blood vessels under the macular in one eye (so called wet exudative AMD). It's very important to remember that neither can you treat AMD with vitamins nor can you restore your lost sight, though in some cases vitamins help to retain vision. You could consult your ophthalmologist, if you are at risk and if you should take food supplements. Clinical testing have proven that the sooner you start preventing macular degeneration, the bigger the odds of postponing the disease or to noticeably slow down its progress. Eating healthy, e.g. fresh vegetables and fish, surely has a role in reducing the risk of AMD. Certain forms of the exudative AMD can be treated with laser surgery which is done during an ambulatory procedure. In case of laser treatment or photodynamic therapy the leakage damaging the macula caused by blood vessels is slowed down or stopped with focused light rays. These courses of treatment help to retain vision in a great extent, but they can't make vision return normal. Despite enhanced medical treatments, a lot of people with AMD still experience some loss of vision. An ophthalmologist can help patients adjust with weakened vision by assigning special optical devices or directing them to a specialist or a centre that deals with visual disability. Since macular degeneration does not usually affect the periphery vision, one can continue doing its favorite activities, using optical devices to enhance vision, e.g. magnifying and TV-appliances or devices that talk or are connected to a computer. You can check your vision by using Amsler Grid (you find it on www.ksa.ee). 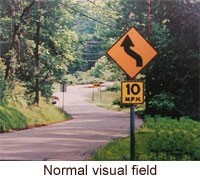 With this you could observe changes in your vision which you would normally not notice. Put on your reading glasses and hold the grid in bright light at a distance of approximately 30-40 cm from the eyes. Concentrate with your uncovered eye on the dot in the middle of the grid. Observe if all lines of the grid are straight or if some of the areas are distorted, darker or blurry. If a part of the grid is wavy, fuzzy or dark, make an appointment with your ophthalmologist immediately. Glaucoma is an eye disease in which the normal fluid pressure inside the eye rises, leading to vision loss - or even blindness. At the front of the eye, there is a small space called the anterior chamber. Clear fluid flows in and out of the chamber to bathe and nourish nearby tissues. The balance between how much fluid is made and how much fluid leaves the eye determines the pressure in the eye. If all is working well, the fluid made inside the eye equals the amount of fluid leaving the eye, and the intraocular pressure is normal. In glaucoma, for still unknown reasons, the fluid drains too slowly out of the eye. As the fluid builds up, the pressure inside the eye rises. What harm does high pressure do to an eye? The weakest and most delicate structure of the eye is the optic nerve. Unless high pressure in the eye is controlled, it may cause damage to the optic nerve which is at the back of the eye. The optic nerve cells' job is to transform the light entering the eye into electrical impulses that can be understood by the brain. Every person has a different pressure to which their eye is sensitive. The optic nerve cells become damaged when the pressure is too high for the nerve cells in that particular eye to tolerate. If enough of these cells die then some vision may be lost. At first, there are no symptoms. Vision stays normal, and there is no pain. Subsequently, as the cells die vision is slowly lost forever. Glaucoma is New Zealand’s leading cause of preventable blindness, but many people are unsure about what it is, and what they can do to avoid vision loss from glaucoma. Yet the news is mainly positive! With early diagnosis and proper care the vast majority of glaucoma patients will retain their sight. The key is early detection. What is glaucoma? Glaucoma is a name given to a group of diseases in which the optic nerve at the back of the eye is damaged, usually due to the pressure inside the eyeball being too high. How will I know if I develop glaucoma? The best way to detect glaucoma is to have regular eye examinations by an optometrist or eye specialist from the age of 45, or earlier if there is glaucoma in your family. This way warning signs will be picked up early. In the early stages of glaucoma there are no apparent symptoms, but damage is occurring that can never be repaired. There are a range of treatments available, all aimed at lowering the pressure within the eye and preventing further vision loss. Most commonly medication is delivered in the form of regular eye drops. Who has glaucoma? A family history of glaucoma greatly increases your likelihood of developing it. Glaucoma can occur at any age, but it is increasingly likely as we get older. Also at increased risk are people with diabetes, high blood pressure or myopia. Although older people are at a higher risk for glaucoma, people of all ages including babies and young adults can get glaucoma. Glaucoma affects 2% of the population over the age of 40 years, and 10% of those over the age of 70. However, with proper care less than 2% of patients with glaucoma will go blind. There are two main types: Congenital retinal pigment epithelial hypertrophy (CHRPE) is usually found before patients reach 30 years of age. They may enlarge with time, but are not commonly associated with malignant transformation. There has been an association made between people with Gardner's Syndrome (familial colonic polyposes) and CHRPE. If your eye care specialist has told you that you have congenital retinal pigment epithelial hypertrophy, it is reasonable to tell your gastroenterologist so that he may recommend the frequency of your screening tests. This is a case of congenital hypertrophy of the retinal pigment epithelium, "bear-tracks." They too block fluorescence. Acquired retinal pigment epithelial hypertrophy is typically found later in life. They are typically jet-black to gray, flat, with a halo around its edges. They are variable in size, and may develop lacunae of lightly colored areas of atrophy (see above). These tumors are more commonly found in the peripheral retina where thickness is more difficult to judge by ophthalmoscopy. Almost all patients with retinal pigment epithelial hypertrophy do not have symptoms. These pigmented intraocular lesions are found by eye care specialists during dilated examination of the inside of the eye (ophthalmoscopy). Eye tumor specialists can differentiate between retinal pigment epithelial hypertrophy and melanoma by clinical examination (without a biopsy). Retinal pigment epithelial hypertrophy can be diagnosed by ophthalmic examination. This will include a careful history for familial colon disease (polyposes). The eye examination will concentrate on the appearance of the retinal pigment epithelial hypertrophy. These lesions tend to be black or atrophic. They may be surrounded by a halo of less pigmented tissue or exhibit a sharp demarcation line. Ultrasonography typically shows that RPE hypertrophy is flat to minimally elevated, normal or slightly hyper-reflective.